Enel’s acquisition of eMotorWerks marks the utility’s third purchase of a U.S. grid edge company this year. Italian multinational power company Enel acquired the U.S. startup eMotorWerks this week. 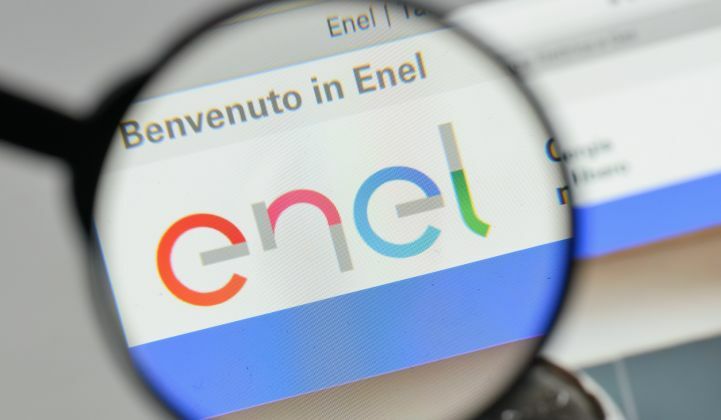 Italian multinational power company Enel Group has announced yet another grid-edge acquisition in 2017, this time tapping into the U.S. e-mobility market at the advent of aggregation of electric vehicles for grid services. Through its recently acquired subsidiary EnerNOC, Enel acquired North American e-mobility solutions provider eMotorWerks this week for an undisclosed amount. This is the third acquisition of a U.S. company by Enel in 2017. This is the latest in a series of acquisitions by Enel in the distributed energy space (the company also purchased U.K.-based Tynemouth Energy Storage earlier this year). And it is not the only European energy giant making moves as Shell, Engie, Centrica and EDF have acquired solar, energy efficiency and other distributed energy resource companies. Download this complimentary GTM Research note here. In 2017, Enel has bulked up its E-Solutions portfolio with four strategic acquisitions in the U.S. and Europe. EMotorWerks’ JuiceNet energy services platform optimizes electric-vehicle (EV) charging with real-time electricity pricing and availability of renewables and allows for remote access control and usage tracking, in addition to providing the opportunity to participate in grid services. JuiceNet was first deployed with the company’s JuiceBox charging station. Currently, JuiceNet is made available via software-as-a-service, hardware plugins for existing third-party EV supply equipment (EVSE), and the JuiceBox EVSE hardware and firmware reference design. EMotorWerks has been the only EV flexibility provider to win capacity in the California demand response auction mechanism (DRAM). For the 2016 and 2017 DRAM eMotorWerks committed EV-charging load curtailment from its JuiceNet network of EV charging stations. In addition to day-ahead market participation, JuiceNet resources participated in the real-time energy market. In 2016, utility flexibility commitments include 900 kilowatts for SCE, 300 kilowatts for SDG&E, and unspecified capacity for PG&E. In the 2017 DRAM, eMotorWerks committed 450 kilowatts in SDG&E and an undisclosed amount in PG&E’s 56.4-megawatt portfolio. EMotorWerks is no stranger to working with a demand response aggregator, having partnered with OhmConnect for California's Plug-In Electric Vehicle Submetering pilot in PG&E, SCE and SDGE territories. Participation in utility and wholesale flexibility programs, both standalone and in partnership with aggregators, gives eMotorWerks a unique edge for distributed energy resource aggregation. Working with EnerNOC will allow for unique pairing and optimization strategies for both utilities and customers seeking to stack various value streams. Enel’s E-Solutions shopping spree is just getting started, with large pockets of opportunity remaining to be filled in its four focus areas. Last week, Enel’s CEO Francesco Starace told Bloomberg that the company is in the market for more battery storage. 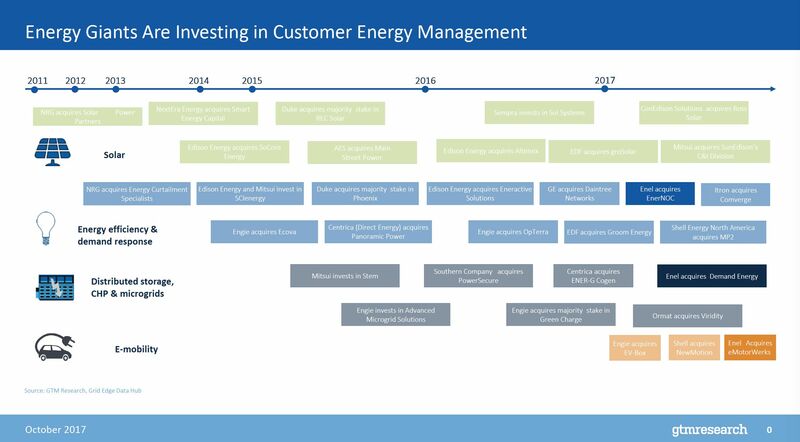 Battery storage will likely be next, but not the last acquisition from Enel, with entire market segments such as smart home solutions and smart cities remaining to be tapped. Analyst Perspectives are only available to our clients. This note is complimentary. Our clients receive market analysis through timely perspectives and in-depth market reports. See GTM Research's Grid Edge Service for more information, or contact gridsubscription@gtmresearch.com.